So instead of posting all the updates for my work in the last month, you can see all my updated progress by clicking here. I have one other piece I've been working on but it is a gift so I haven't posted any progress pictures, I'll post some as soon as it is complete! I do want to highlight a piece I've been working on the past few days (I'm counting it for this WIPocalpyse update! 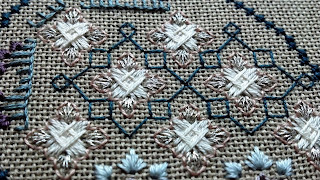 ).....the Around the World in 80 Stitches SAL by Papillon Creations. Oh my goodness, I am LOVING this SAL! 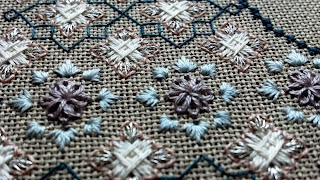 This SAL takes you 'around the world' and introduces you to different specialty stitches around the world! This SAL comes in 24...yes....24 installments! When I first heard about this months ago, I thought to myself....two years is way too long...I can't do it! She has been such a dear...answering my questions about the chart and giving me tips and pointers! You can get more info about this SAL at the Papillon Creations site. They also have a gallery of pictures for this piece....there are so many variations out there! 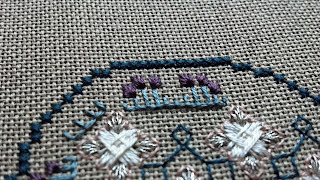 Work can be done on either 28 count or 32 count for the specialty chart (there is also a cross stitch only chart for those wanting to work on aida). I chose 28 count sage laguna. 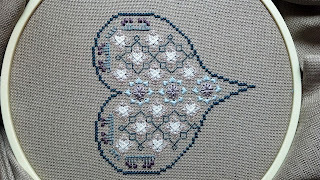 There are 2 hearts in month 1....I've just finished the first one and hope to have the second one complete in the next few days. I'll add the beads on after all the stitching is done, so I can continue to use my hoop and not ruin any of them. I'm off to work on the second half of month 1 (more Lazy Daisies...oh no!)....... then look at everyone's updates! I love the colors you chose. They look great on that fabric. I wanted to do this SAL, but I may start it much later. I promised myself I would finish some WIP before starting any new ones. Good on you for all those specialty stitches! Sometimes, subtle colours make for a very sweet combination and your Papillon SAL is just one of those times. Love it! Those specialty stitches look so interesting. 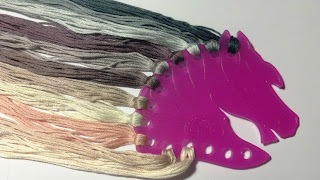 Your SAL looks brilliant Lesli.I love the colours you have chosen.What metalliic did you choose? It shows up really well. 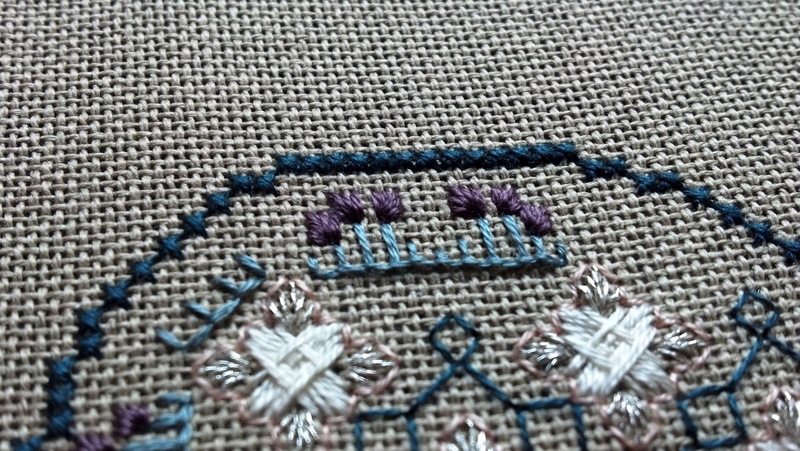 I know what you mean about the lazy daisies,they were the most difficult stitch for me on part one. Your other projects are looking great too,especially Moonlight Immersion..gorgeous. I love your WIPocalypse page! You are so organized by having that list in your side bar where you cross out each page that you finish. You have a beautiful start to your Around the World SAL! Your projects are coming along great. Love the colours for your new project. So pretty! 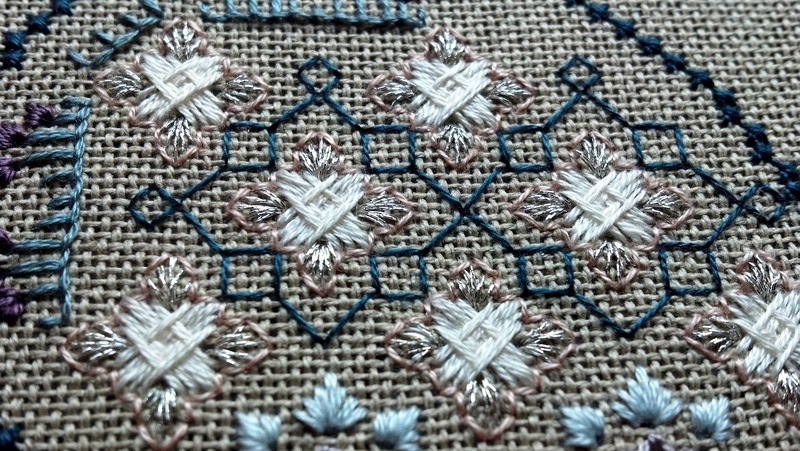 The colours are lovely and I think your speciality stitches look great. Well done. Your colours are just great. Nice and subtle and very complimentary. Well done. Your specialty stitches look amazing! Love your Part 1. I gave up on the Lazy Daisies! I did ray stitches instead LOL. 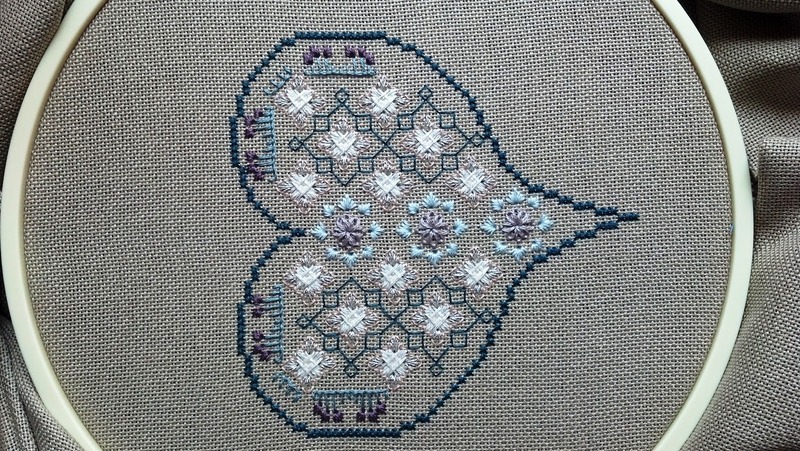 I have a page on my blog with links to people stitching this, may I add you? So we can cheer each other on. I absolutely love this SAL and every time I see it I'm tempted to start it! I've been resisting but I don't know how long I'll be able to! LOL Love your choice of colors - Nothing wrong with subtlety and they're along the same lines of colors I would have chosen. 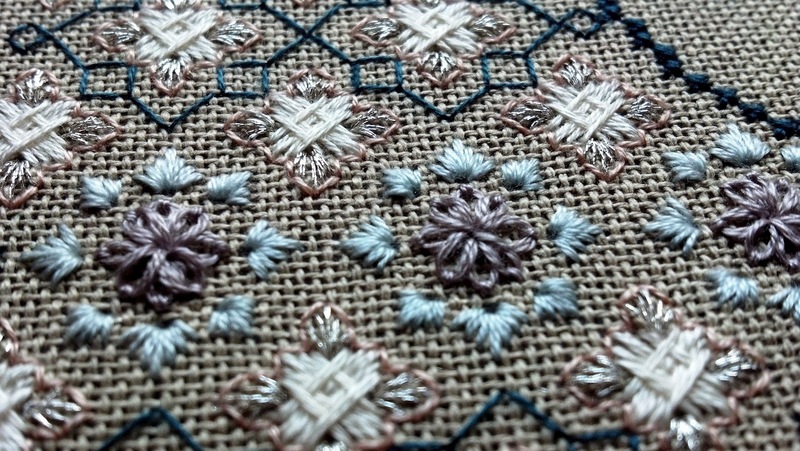 lovely stitching :D I love the colours you chose. I wouldn't pick them myself but they look really cool together!